Caption slip reads: "Photographer: Glickman. Date: 1952-04-03. Assignment: Kid falls from 2nd story window. North Hollywood. Police Officers look at 2nd story window from which 2 year old Diana Slade fell with her milk bottle. Officer examines bits of broken bottle where kid fell. 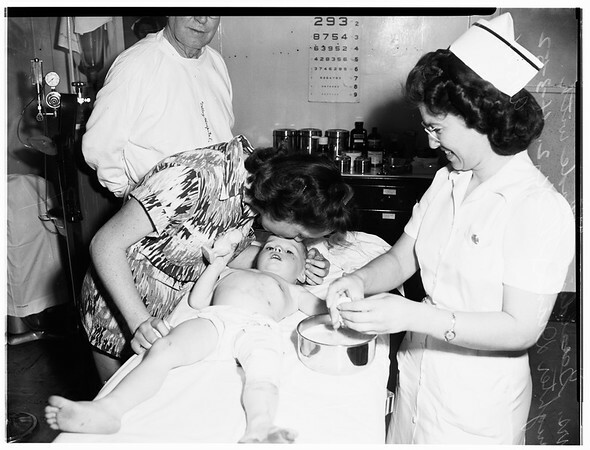 At Valley Receiving Hospital Mrs. Geraldine Slade and her baby Diana as Dr. and nurse work on kid. Nurse and Diana Slade. Kid sustained possible frac. rib and cuts about body as a result of falling on milk bottle".